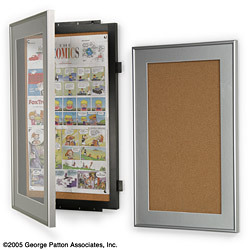 This Cork Board Has a Tamper-Proof Frame That Looks Permanent! This Cork Board Allows Effortless Wall Updates! 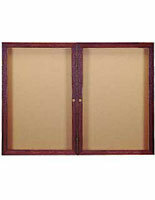 Buy Online at CorkBoards2Go.com! This cork board in reality consists of two frames. A concealed inner frame, which contains the cork board, is the base for the swinging outer frame. 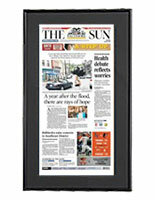 The second frame, the seeable satin silver frame, contains the clear acrylic lens and the decorative silver matboard. The design of the cork board permits this inner frame to be concealed from view keeping the swing open function secret. 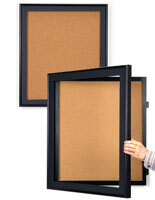 Need a secure method to exhibit subject matter, but don't like the appearance of standard cork boards? 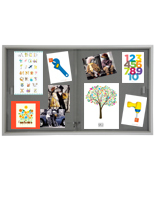 This cork board incorporates a high quality aluminum frame and decorative matboard into an easy to use package. 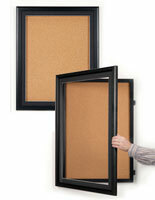 The side lock and concealed hinges enable this frame to be utilized where other cork boards will detract from the décor. 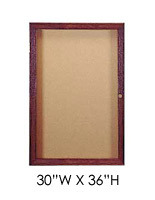 This cork board has a 11-1/2"w x 22"h opening in the matboard. 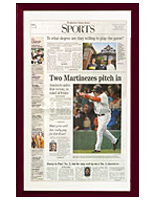 Buy this cork board to exhibit a standard newspaper or numerous subject matter and announcements. The cork board comes with two keys for the plunge lock. Wall mounting hardware and instructions are provided. 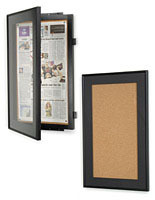 For proper operation of the cork board, a 7/8" wide area is needed to the left of the frame and 1-1/2" on the right.